Your wedding day is a day that you look forward to for years. You imagine yourself walking down the aisle and seeing your groom staring back at you with stars in his eyes. If you’re like most women, you probably spend a lot of time thinking about how you’ll look on your big day, including the way you do your hair and the dress that you choose. Add even more pizzazz to your wedding day look with accessories and products that will make all your guests stand up and take notice. 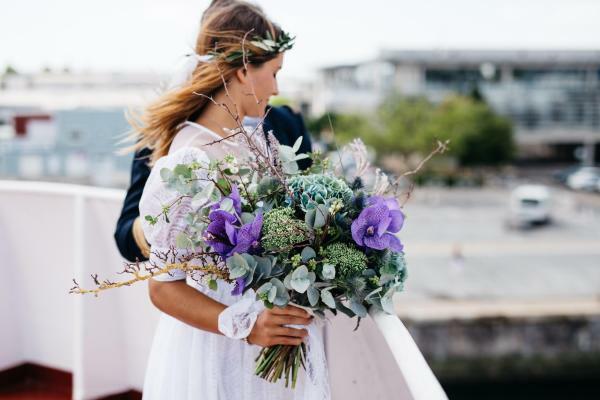 Though most brides carry a bouquet of fresh flowers, you can add a little something extra to your look with fresh flowers that you wear in your hair. Look for flowers that match the ones you carry in your bouquet, or go for flowers in colors that match the reception hall decorations. If you pull your hair back, you might tuck a single flower behind your ear. You can also weave multiple flowers through your hair. For outdoor weddings, a crown of flowers is a great option. Every time you take a step and lift up your dress, those around you will see your shoes. If you’re a funky type of woman, you might opt for a pair of Converse or another pair of athletic shoes in a unique color like lime green or hot pink. Some brides prefer shoes that have a more elegant style. A simple pair of stilettos in a soft white color with a silver heel or metallic embellishments will certainly turn heads, but you might go for a pair of more comfortable flats. Make sure that you break in those shoes to avoid discomfort later. One of the easiest ways to add to your overall wedding day look is with one of the many bridal jewelry sets now available. These sets come with two or more pieces of matching jewelry. You might select a set with a necklace and matching earrings or a necklace with a matching bracelet. Choosing a set with replica diamonds and other gemstones can serve as your something new and something borrowed. Buy a set that matches the style of your new wedding ring. Look your best and add some pizzazz to your wedding day with the right jewelry, shoes and some fresh flowers.